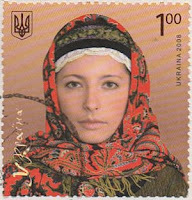 Some beautiful stamps from Ukraine for the 100th episode of Sunday Stamps run by Viridian. 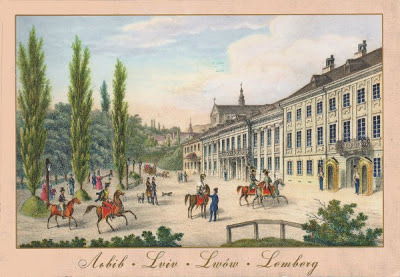 The postcard shows an 1821 view of the Palace of Governors, now the Regional Council in Lviv. Why not join in? This is a post for Sunday Stamps, now hosted by Violet Sky at "See it on a Postcard!" The second one has a rather humungous dragonfly near her - I wonder if she knows?! I think I have the exact same stamp in the middle.Lovely!!! What gorgeous stamps and the lady pictured is so beautiful. I agree that lady is so beautiful, and the flowers are lovely too. thank you for participating this week! Lovely stamps; that lady looks so serene. The miniature sheet and the postcard are nice companions. 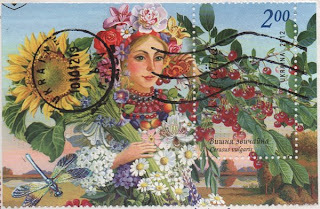 I had to have a look to see what the whole sheet ("Generous Ukraine") looked like and it shows her clothed in flowers, what a beautiful idea to portray summer in the Ukraine.